Jonathan Lee Riches is a longtime agitator. After Donald Trump was elected, he began calling out some anti-Trump protesters on pro-Trump Facebook pages — leading to harassment. Two days after Nicole Farnham created a Facebook event for an anti-Trump protest in Pottstown, Pennsylvania on Saturday, Nov. 12, she was getting attacked by hundreds of commenters and threatened with lawsuits by a former boss. It was all thanks to one self-described troll. The harassment came after Jonathan Lee Riches posted the 19-year-old Temple University student’s name, two photos, and former place of employment on two pro-Trump Facebook groups containing well over 500,000 members. “Expose the People who are hosting these Anti Donald Trump events,” his post read. “I was genuinely scared for my safety,” Farnham told BuzzFeed News after seeing the comments and other commenters searching for her whereabouts. Commenters flooded the restaurant's page with apparently false stories. One claimed Farnham gave her bad service because the person wore a Donald Trump pin. Farnham hasn't worked at the restaurant for over a year — a fact her former boss pointed out to the commenter. Her former boss wasn’t happy. In three voicemails to her that were reviewed by BuzzFeed News, Ed Anghelache, the restaurant’s owner, threatened to sue Farnham and her family. “There will be repercussion for the actions you did,” he said, incorrectly assuming the reviews were coming from Farnham’s friends. “I hope you get a good lawyer, and your parents as well,” he said, adding that he hopes she doesn’t get expelled from school. Some background on Riches: He has served 10 years in federal prison for running a phishing scam. 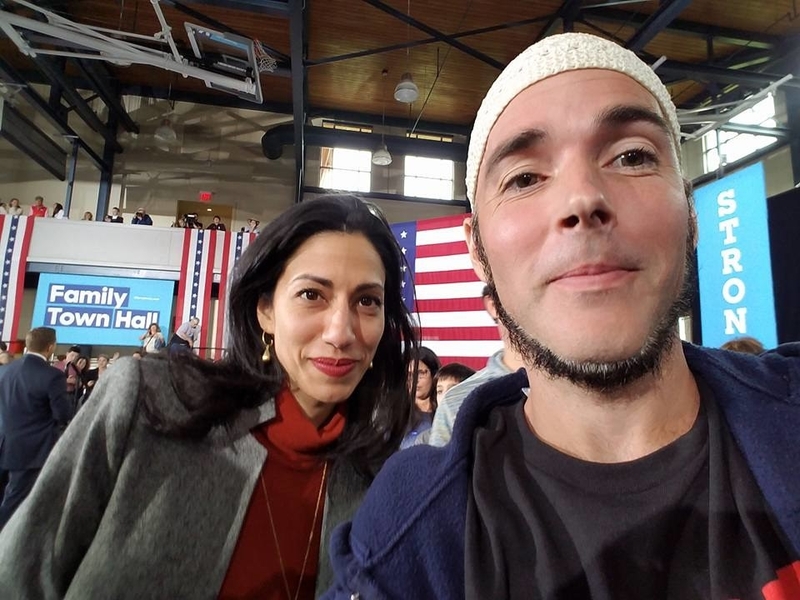 He has filed hundreds of frivolous lawsuits, harassed residents of a Connecticut town after a school shooting, and has costumed himself (poorly) as a Muslim and managed to get selfies with Hillary Clinton and her top aide, Huma Abedin. Since Trump was elected, he has been intimidating and encouraging harassment of people who organize anti-Trump rallies on pro-Trump Facebook pages and posting racist language on his own feeds. I feel it's my Patriot duty to inform the public who exactly is hosting these Protests online through social media which then gathers a bunch of people protesting at those locations. As you see on my JLR page & my twitter that the people hosting these Protests come from all walks of life. From high school kids, to big wigs & Planned Parenthood, people who come from other countries. I also trolled/attended protests in Philadelphia that I documented & to see first hand how they work. I will continue to expose & identify who these people are as its my right & duty of mine to inform communities who these people are & give the community a heads up to protect themselves in case these civil disobedience street protests turn violent. I don't think these hard working Americans who have to be subjected to having to be clogged in traffic when these people March up streets & disrupt traffic without a permit. I thwarted some protests already by exposing the people who were creating them. I called schools to inform principals/administrations when I see a student creating a protest event to give them a heads up. I also expose anyone I see online who creates these petitions defying Trump. I feel Anti Trump people creating protests & petitions against him or any president elect are traitors to democracy & the public has a right to know who these people are. Alot of the people I exposed got removed from Facebook for violating fb community standards, which I don't get cause these people are already identifying themselves who they are hosting these Protests & why would fb coddle/protect these protester organizers knowing these Protests in the streets are illegal. Riches spent time prison for fraud and conspiracy, part of a group that reportedly netted over $1.5 million in a phishing scam. In prison, Riches filed 3,000 handwritten frivolous lawsuits against seemingly everyone, in “virtually every district in the country,” according to a 2013 profile in the New Republic. He sued George W. Bush, Allen Iverson, and even himself. He once sued daylight saving time. He told BuzzFeed News it was an attempt to “fill time” while making “a mockery of the system.” The Smoking Gun, Gawker, the Huffington Post, and local news websites picked up on the absurdity of his lawsuits. When Riches was released in April 2012, online video became his platform of choice. In December 2012, Riches was arrested for violating probation after he filmed himself driving to Newtown, Connecticut, shortly after 26 people, 20 of them children, were slaughtered in a school shooting. In a YouTube video, Riches talks to two dolls designed to look like the shooter, Adam Lanza, and his brother, Ryan. He taped himself driving close to the Lanza home. Later, at a memorial for the victims, Riches identified himself as Adam Lanza’s uncle, Jonathan Lanza, to reporters, telling the New York Daily News that the shooter was taking antipsychotic drugs. He was photographed kneeling in front of flowers and candles. 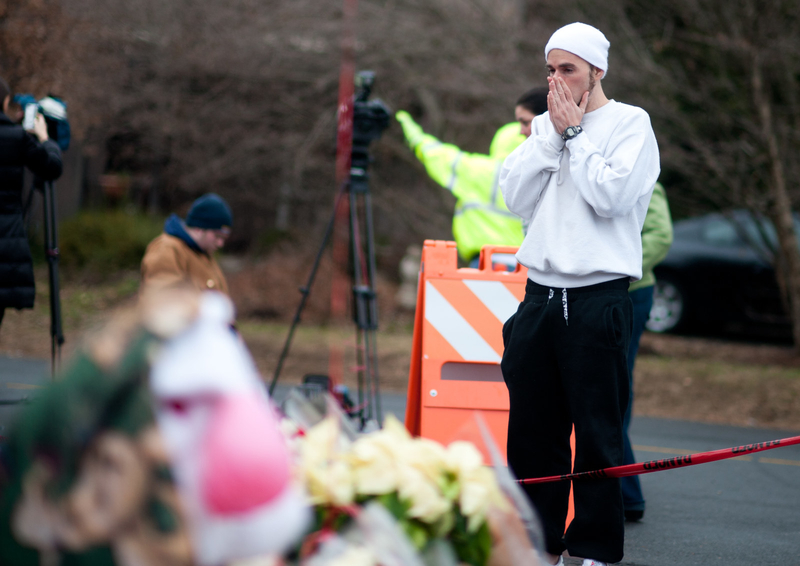 Riches identifying himself as Jonathan Lanza in Newtown, Connecticut, in 2012. 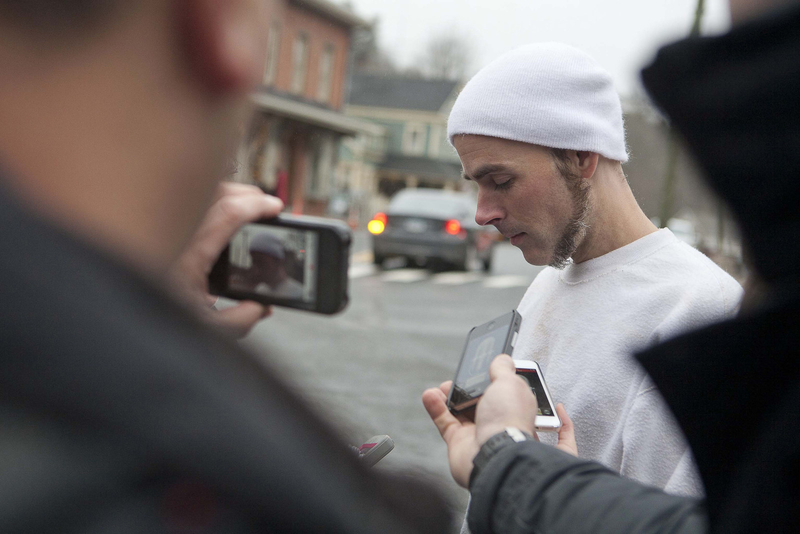 At the probation violation in Chester County, Pennsylvania, where he lived at the time, Assistant District Attorney Andrea Cardamone said the part of the video where he tried to call Ryan Lanza was a “violation of his probation for disseminating personal information on the Internet,” the Daily Local News reported. He served three years for leaving his judicial district, and prison records indicate he was released in May 2016. Riches and his lawyer during the hearing said he was mentally ill.
Riches told BuzzFeed News that the prosecutor’s reference to posting information online was likely about a time when he posted the private information of his probation officer. As the presidential campaign went on, Riches — once described as a “rally junkie” — attended events for both Democrats and Republicans. Selfies posted to Facebook show him posing with Hillary Clinton at one rally and with her aide, Huma Abedin, at another. In both photos, Riches is wearing a Muslim prayer cap. In another photo on his page, Riches appears to be at a rally, holding a “Muslims for Hillary” sign. Some of the trolls Riches unleashed relented. “The owner seems [like] a nice guy i removed mine also,” said one person who wrote a negative review of the restaurant. “I’m not against what she does, any body is free to do whatever they want. But when someone attacks my restaurant without stepping a foot inside, I have to protect my business,” Anghelache told BuzzFeed News. Anghelache said he received 600 negative reviews in half an hour when it all began. “I don't know when it's going to stop. I don't know what to do. I don't even know how to report it,” Anghelache said, adding that negative reviews keep coming in. Farnham admits that some of her own friends, on their own volition, began giving the restaurant bad ratings after reading that the owner had called her a “disgrace.” Farnham talked with her former boss and her parents — who were upset with her and frightened about the threats of a lawsuit — smoothing things over slightly. She encouraged her friends to remove their negative ratings and apologized to the restaurant on Facebook. Farnham went to Temple University Police on Nov. 14, and said an officer told her that the police could not do anything because the harassment was taking place online. The university police department told BuzzFeed News it would not reveal any information regarding students and harassment. Three days later, Farnham went to the Philadelphia Police Department’s 22nd District and met with an officer who advised her not to go into work that weekend. Farnham’s former boss, Anghelache, in his earlier Facebook post, disclosed Farnham’s current workplace, resulting in pro-Trump supporters calling every location of the franchise in the area to “expose,” as Riches said, her. As Farnham visited the police departments, the harassment continued. A video was posted to YouTube with a picture of her and a computerized voice urging: “Nicole Farnham is a traitor against the United States. Treason. This person lives in Pennsylvania. Please share and expose her.” It is unclear who made the video. BuzzFeed News reached out to four other people who organized anti-Trump protests and were subsequently noticed by Riches. In each case, Riches posted the organizer’s name and date of the protest, along with two identifiable photos of the organizers on Facebook. “It shocked me, but only in the sense that it happened so quickly. I didn't expect something like that to come out within a week of starting the protest, so that was surprising,” said Olivia Antezana, who is organizing an anti-Trump protest in Washington, DC, during the inauguration. “I wasn't really offended either, just concerned. The OP and commenters didn't say anything that could affect me because I know who I am and I know what I stand for,” Antezana added. Two others who were targeted by Riches told BuzzFeed News they weren’t previously aware of his posts but found them extremely disturbing. Kaitlyn Hodge, who organized an anti-Trump rally in Costa Mesa, California, believes that enhancing security features on her Facebook page before the protest saved her from online harassment. Photos and Facebook Live videos on Riches’ Facebook page on Nov. 12–14 show him attending many anti-Trump rallies in Philadelphia after the election. “We have a right to counter-protest protests,” Riches said. When asked if he would have embarked on the same crusade if Clinton won and pro-Trump people were organizing protests, he said he would have absolutely at the very least identified them. While Facebook has recently announced plans to address the issue of fake news on the social media site, it is unclear what actions, if any, Facebook will take on self-professed members of the alt-right community, like those who appear to be engaged in Riches’ hunt for anti-Trump protesters. A spokesperson from Facebook confirmed that Riches’ posts do not violate the “Bullying and Harassment” and “Direct Threats” policies outlined in Facebook’s “Community Standards,” since Riches’ posts did not contain a threat of physical harm and did not disclose personal information that was not already public. Riches’ posts have increasingly became pro-Trump. He himself said his support for the president-elect is genuine. At times his Facebook posts contained racist rhetoric. “It will be Bigger than Berlin’s wall & bigger than a n*&ger’s Cawk,” he wrote on a Nov. 9 post. In another post, he said, “I hope Donald Trump doesn’t deport my illegal Mexican ex who lives at …,” with the remainder of the post containing an address. Riches said he wants “to kind of get back at these people and ... expose people that are against the system,” using Black Lives Matter protesters and anti-police protesters as examples. Riches told BuzzFeed News he has no remorse and considers his actions no different than the media that covers protests, but with his own twist — publicly singling out the organizers. “I want them to be accountable for what they do,” Riches said. “Basically I’m just a source of information. If anyone chooses to do whatever they want what that information that I provide, then so be it. I’m not going to have any remorse,” Riches said of the fallout from his posts. “If you don't like this country, get out, behave. These are the rules, these are the laws. I had to follow them and I didn’t, and I had to pay the consequences,” Riches added. As for Riches, it is unclear from a legal standpoint, in addition to any probation regulations, what his exposing of anti-Trump protesters entails. Riches believes that his posts do not constitute harassment since he is posting publicly available information and is not interacting with the organizers by calling them on the phone or posting to their Facebook page. The District Attorney’s Office in Chester County, Pennsylvania, declined to comment.